Mug Cake for Breakfast? Yes Please!!! Yes I'm a trainer, but sometimes I just want dessert for breakfast. Am I the only one? My Silver Fern Protein Mug Cake is the best way to enjoy something truly decadent while getting in my protein. The greatest part, there's no added sugar but this is perfectly sweet. I've been known to enjoy this for lunch, dinner or a snack as well! Thanks to Cenavi Chocolate Flats, I only need 1/2 a square to get warm, gooey, melted chocolate that allows me to have this daily if I want. Bonus: you never feel deprived because this fits into a healthy lifestyle AND you'll still fit into your favorite jeans! Add all the dry ingredients in a microwaveable mug or bowl, mix well. Add the milk, egg & extract into your dry ingredients and stir until well mixed. Microwave for 1:30 seconds. Break up 1/2 a Cenavi Chocolate Flat to sprinkle on top (only 35 cals.). Optional: I add a dollop of SoDelicious Coconut Whipped Cream (only 30 cals.). Nutrition Facts: 247 cals., 11g fat, 20 g. carb., 21g protein. You can adapt the calories by using egg whites only or making any other substitutions to your liking. Rest assured this is husband and kid approved. Both the whey and plant-based protein powders work great, plus you can change the flavor to your preference. 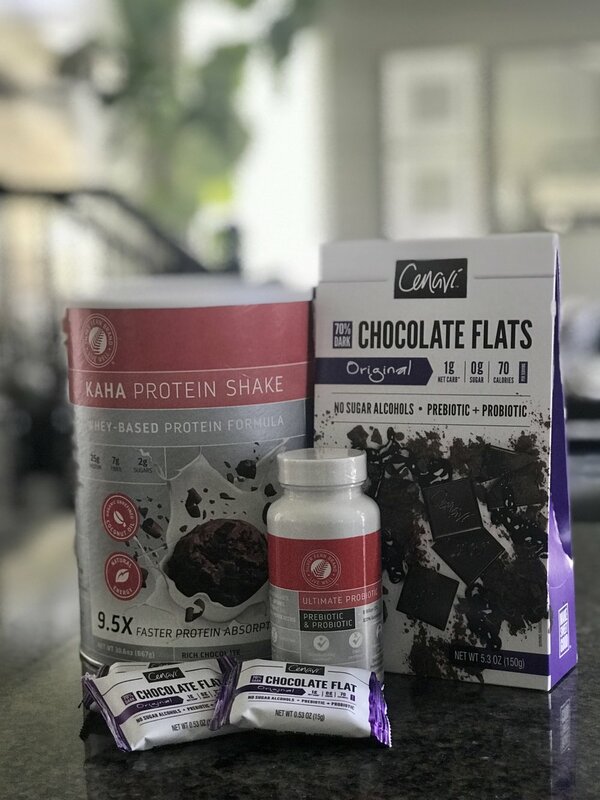 Silver Fern's vanilla and cookies & cream protein flavors are a big hit with my girls as well as the chocolate and chocolate mint (my personal fav)! By using the coupon code Mindy10 you can go to www.mindybuxton.com where you'll see the Silver Fern box at the bottom of my home page. This code will get you the best prices for any of these 3 items mentioned or your favorite Silver Fern Brand foods. Sign up for my March BodyJoy Slim Down challenge at www.mindybuxton.com. Registration closes February 26. See how many inches you can drop in only 4 weeks! Share this Blog Post on your page for a chance to win a free spot! Winner will be announced by March 1. A Winning Idea for the Upcoming Big Game! As a pouting Denver Bronco fan, I just realized that the BIG GAME is this upcoming weekend. I thought I’d pass on my simple, option-loaded, Ceviche recipe that can be enjoyed several different ways. Regardless if you prepare this dish or your own recipe, I challenge you to prepare one thing healthier at this year's football party! Remember to have a few health food options along side those treats we all enjoy! There's room for both, right?!?! Preparation time: 15 minutes to prepare, let soak overnight in fridge. In a glass casserole dish, either Pyrex or ceramic, place the fish, onion, tomatoes, salsa, cucumber and cilantro. Squeeze in lime juice. Stir well, making sure the fish gets exposed to the acidic lime juice. Let sit for several hours in the fridge, giving time for the flavors to blend. (My daughter adds a splash of her favorite hot sauce!) ALSO, if you leave the avocado pit in the mix it won’t turn brown. Serves 8. Approx. 80 calories per serving of the fish ceviche mix. By popular demand, I'll be sending my BodyGym Football Challenge out at the end of the week to give you a fun option for enjoying the BIG game! I hope you have a happy and healthy week! For a few more free recipes go to www.mindybuxton.com to sign up for my Most Made's Recipes! So...January's a little more than half way over and this is the time when people tend to get burnt out on their "resolutions." Why are they so hard to stick with? When you do a complete overhaul on your life with new food, new workout routines, and eliminating tons of things you used to do, it gets overwhelming. When you keep things simple, your goals become manageable and results will show up through consistency. Simplify Workouts. Just move anyway you like for at least 30 minutes a day. Go on a walk, jump on a tramp, stretch, go to a class, do push ups and squats---any movement counts and some exercise is better than no movement at all! BodyGym is my favorite go-to since I can do it when and where I want. Women underestimate how important strength training is to their health, not to mention inch loss. Experts are now saying it's as crucial as getting yearly exams. Strength training is necessary for our health--and in my case, my happiness and mental sanity! Make it easy on yourself by scheduling it a week at a time. Get out your calendar or phone and write in appointments that work for you. Treat it like any other important appointment you schedule. Write in exactly what you'll do for your workout--a walk, body weight exercises, swim, etc.. This takes the guess work out once the time comes around. Keep Food Simple. Have a protein or two on hand at all times. If you've got eggs and chicken in your fridge all you need to do it grab a few vegetables and you've got yourself a simple meal. How easy is it to make an omelet or throw together a salad, taco or soup with just a few food items? Cook in large batches so you only have to do it sparingly, but you can eat off that meal a few times. Do What Works for You. Keep yourself focused on your needs and your goals. Eat only foods you love, move in ways that your body loves and trust that if you have joy in the process you'll continue to do it. Consistency, not deprivation is what leads to success. I hope you can simplify your eating and exercise so you'll continue to keep some of these New Years habits going all year long. If for whatever reason you didn't start improving your health January 1st, it's never to late to start. It's an awesome thing that simple leads to results! Sign up for more tips & free recipes below or by going to at www.mindybuxton.com. My online BodyJoy Slim Down Challenge includes 7 simple strategies. I don't believe in extreme rules or restrictions, just smart concepts that've been proven to help you hit your goal. One strategy I focus on is eliminating processed sugar & artificial sweeteners. I encourage participants to aim for 6 or less grams of sugar so they can eat it more mindfully. We avoid sugar alcohols and look for stevia, monk fruit extract or other fruit as a smart alternative. Use these tips taken from my Recipe E-Book. Make your own homemade ice cream by doing ½ the sugar amount the recipe calls for. Use coconut sugar rather than white sugar. You'll love the flavor it adds not to mention the nutrients! Try using in-season fresh fruit chopped or sliced as a simple, fast, delicious dessert. Think fruit bowl once in a while! I enjoy slicing fresh apples or pears in a bowl. I sprinkle them with cinnamon and a little Silver Fern Brand vanilla protein powder, adda bit of vanilla or almond extract and microwave for 2 minutes. Sometimes I add just a pinch of sea salt. You can drizzle melted peanut butter, sprinkle with chocolate protein powder or melt a little chocolate over yours as well. That leads me to my favorite option...chocolate! Sometimes we just need a taste of something intense to get satisfaction. Think quality of flavor vs. quantity! I love great quality chocolate such as Cenavi Chocolate Bark or the Theo Organic Mint Chocolate bar. Just a piece or two can satisfy my craving for something sweet. You have to try the Cranberry, Blueberry & Ginger Cenavi bark! It's my absolute favorite. I love how I don't even need a full serving, just a small piece to get the sweet fix I need so I can keep my cravings under control. I love that these barks have probiotics and fiber in them but taste like "regular" chocolate. They offer 3 delicious flavors! Treats should be savored with each taste and enjoyed without guilt, right?!?! When you ELEVATE your idea of treats, you find you can enjoy them without sacrificing your goals. Remember it's not about perfection, deprivation, or being extreme. There's room for treats in moderation. Through the month of January, use the coupon code SIlverFern10 for a discount on any protein powder or chocolate bark items found by clicking the chocolate above. I bet these chocolate barks will become your new favorite! I've added a link to my website on the bottom right just to make it easier for you to find. Watch for my upcoming FaceBook LIVE for more ELEVATED treat ideas! I hope you've been enjoying this festive time of year! I'm loving the winter wonderland that's outside my front door. I'm balancing the celebrations (which obviously include chocolate) with still finding time to squeeze in short but effective workouts. At parties I've focused on getting in my veggies and protein before I indulge in my treats. I love not feeling deprived but also not feeling overstuffed and sick because this year I just haven't wanted/needed to over indulge. Thursday I'm going to share WHY. But I can tell you right now, this is a good place to be mentally & physically! Know if you've gone a little overboard on the treats, you can get back to eating healthy your very next meal. Go for a walk or get in a few push ups and lunges. Nothing needs to be extreme and every little bit of movement adds up. Don't wait for January 1 to start making yourself better, join me Thursday at 11am MST for a Facebook Live with Charity Lighten. Charity is chief nutritionist for Silver Fern Brand. I'm going to let her explain the science behind some of the mentioned benefits I'm experiencing. I'm so excited to share with you how BodyJoy is getting ELEVATED starting January 2017! Until then, enjoy Charity's popular KSL article "Hit a diet plateau? 6 steps to jumpstart your weight loss!" Be sure to go to the SilverFern Brand Facebook page to join our live discussion Thursday! We'd love to answer any of your questions or to say Hi. You don’t want to miss out!